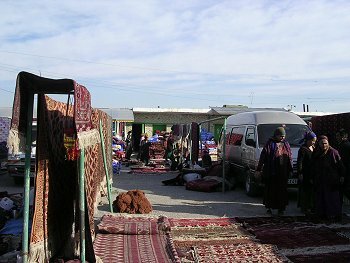 A millennium ago Turkmenistan straddled the Silk Road, the most important and lucrative trading hub in the known world. Today the Turkmen trading instinct survives. But it’s focused on those few travelers who come to peruse the Tolkucha bazaar, one of Central Asia’s largest markets, near the capital city Ashgabat. “For you, $40,” a middle-aged woman says, as I pause in front of her stall. She’s selling antique pottery fragments and silver jewelry, battered pewter kitchenware and Soviet lapel pins, all lain out in white shoe boxes and cream-colored cotton handkerchiefs on top of a worn burgundy carpet. Turkmenistan, a gas-rich desert nation trapped between Afghanistan and Iran, has spent a lifetime languishing in not-so-splendid isolation. Saparmurat Niyazov, the megalomaniacal president-for-life, promised that the 21st century would be an Altyn Asyr — a golden age. Niyazov died in late 2006, of heart failure, after a 21-year reign. But the police state he built lives on. The morning sun tempers a chill spring wind, which wafts the smoky smell of shashlik, a stick of mutton served with vinegar, onion and chopped herbs, across the crowded market. The saleswoman’s brown leather coat slips to reveal an aubergine velvet dress with an intricate embroidered neckline. She pushes her green and crimson floral headscarf, elaborately knotted at the nape of her neck, behind her ears. She pulls out another clay figurine which she says was found at Merv, an ancient and important desert citadel on the Silk Road linking Persia with China. “Forty dollars,” she says again, this time in Russian, waving her hand and smiling to reveal a set of gold teeth. I examine the stone figurines. There is something too fresh about their contours. I’m intrigued by the fakes, but envision customs officials confiscating all my money as punishment for attempting to smuggle out something that looks vaguely valuable. 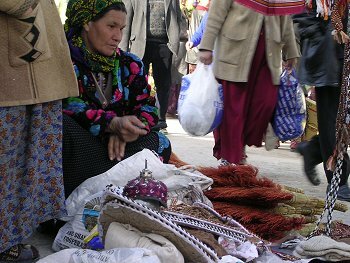 The woman speaks to her partner in Turkmen, a language closely related to medieval Turkish, a cascade of rolling Ls and long vowels with a dash of soft cha-ka-ta sounds. They speak quietly, like somebody might be listening. But nearly everyone does this in Turkmenistan. A uniformed officer is never far away; an informer might be closer. Niyazov was a grand master of the secret police, of closed trials for unspecified charges and of indefinite prison sentences in facilities not marked on any map. Gold statues and giant portraits of the dead president adorn the squares and buildings of Ashgabat, the seat of government and home to the gilded but opaque ministries that run Turkmenistan like a fiefdom. Most Central Asian countries have gingerly embraced imported notions like democracy and human rights. But Turkmenistan has pulled down the shades. The new government is a coven of Niayzov loyalists, drawing their legitimacy from their proven ability to survive his frequent purges. Their policies are modeled on his vision of power — a supreme head of state presiding over a one-party system. The Miras Bookshop, located not far from the country’s leading university, bursts with Niyazov paraphernalia. Six women in ankle length gem-hued skirts stand behind polished glass counters. They are surrounded by evidence of Niyazov’s cult of personality — old calendars featuring the dead dictator in a gray suit, and copies of his book, the Ruhnama, an epic of self-aggrandizement. There are also secondhand copies of Tolstoy and Pushkin. But no shoppers. Odes to Niyazov can also be caught on state television. Pretty girls are placed in parks for readings, which are then beamed into every home before breakfast, after dinner and late into the night. Turkmenistan was invaded, conquered and exploited, by Alexander the Great, Genghis Khan and a succession of Tsarist and Soviet generals. Ancient and medieval caravan trade routes once traversed the Caspian region. Before sea passages were discovered, Turkmenistan was at the crossroads of the world. But its importance faded as the tribal economy degenerated into one centering on camels, sheep and what booty could be lifted from passing caravans trading between Russia and Persia, usually along with the heads of the luckless merchants. The empirical leftovers are underfoot at the hundreds of unexcavated archaeological sites that dot the countryside like muddy outdoor museums. Whole sides of vases lie upturned like rubble. Anything eye-catching is bagged by scavengers, then finds it way to market and into private collections. I decline the stone figurines and cross the market to the shashlik vendors, weaving my way through an alley of carpets and religious stalls selling both Sunni and Shiite religious posters in tropical colors. I sit down to a plate of crispy mutton, doused in vinegar with a side of dense white bread to mop up the juices. The air is thick with white smoke and the smell of fennel and coriander. Suddenly I see the figurines again. Not one but three. For good measure a small clay head has been added. Forty dollars, says the trader, who has cannily waited to close the deal over lunch. Although much of Turkmenistan’s recent past and probable future will conspire to keep to keep it off even the most intrepid traveler’s map, the traders of Tolkucha bazaar are ready for business. I hand over two $20 bills and pocket a little bit of Turkmenistan.